Choosing the high temperature option (HT) boosts the maximum temperature to 500 °C, but de-rates the MAWP to 2000 psi (138 bar). Standard Mini reactors can be converted to high temperature reactors (500 °C max temperature and 2000 psi MAWP) by changing the head openings to cone connections, replacing the valves with high temperature valves, replacing the gasket with a graphoil Flat Gasket, replacing the heater with a ceramic fiber heater, and replacing the split ring. 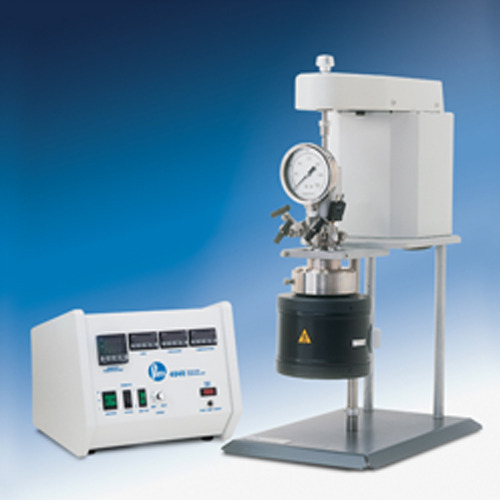 The support system for these Mini Reactors is designed specifically to provide stability at stirring speeds up to 1700 rpm, in a compact mounting small enough to fit into a laboratory hood.